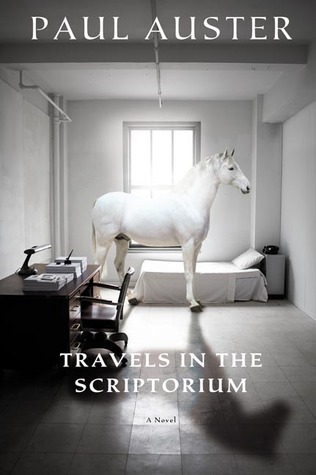 What it’s about: Here’s something I wish I’d known before reading this book: Travels in the Scriptorium should not be the first Paul Auster you read. (Why didn’t I read a review?!) If I’d done my research rather than impulsively grabbing this off a table because of its quirky cover (a horse! in a room!) I would have known that this is Auster’s thirteenth novel and his most navel-gazing, almost a note to longtime fans. As a newcomer, I didn’t realize that all of the secondary characters were drawn from his previous novels, meaning that the entire book is a send-up to his past work, full of oblique references. Obviously I read the book completely differently than a fan would and, let me tell you, it suffered for it. The back cover copy made this seem like a classic closed door mystery: a man trapped in a room, having lost his memory, seeking to discover the sinister force that may have imprisoned him. I’ve seen plenty of great films and books that use this as a frame, so I was intrigued. If you want the “a-ha” moment, you literally only have to read the last three paragraphs of the book. That delivery felt thin, like Auster had dashed off those paragraphs, then built a loose story around it. I was left thinking I’d wasted my time, which isn’t a good sign for a book so short that it’s practically a novella. Travels in the Scriptorium felt like a gimmick. Would I recommend? If you’re a diehard Paul Auster fan, I think you’ll find some fun winks and nods. If you’re a newbie, avoid. There’s not enough substance here to make it worthwhile.